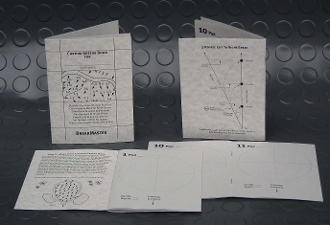 The Custom Greens Book provides golfers a convenient pocket-sized way to chart greens on a golf course. Legal to use during any competition, the Custom Greens Book contains 18 pages (one for each green on a golf course) in which golfers can record the BreakMaster readings they take during practice or casual rounds. One Greens Book should be used for each golf course a golfer plays. If the Custom Greens Book is ordered with the BreakMaster, there is no charge for shipping. If it is ordered on its own, a shipping charge of $0.50 will be added for each Greens Book ordered. There is also a charge of $0.50 for handling (for the entire order).